MEMPHIS, TENN. Nov. 28, 2012—Five men, five stories, one book. On Dec. 5, Marcus Matthews, author of “I Am Not the Father: Narratives of Men Falsely Accused of Paternity,” will appear on the nationally syndicated program the Maury Show. 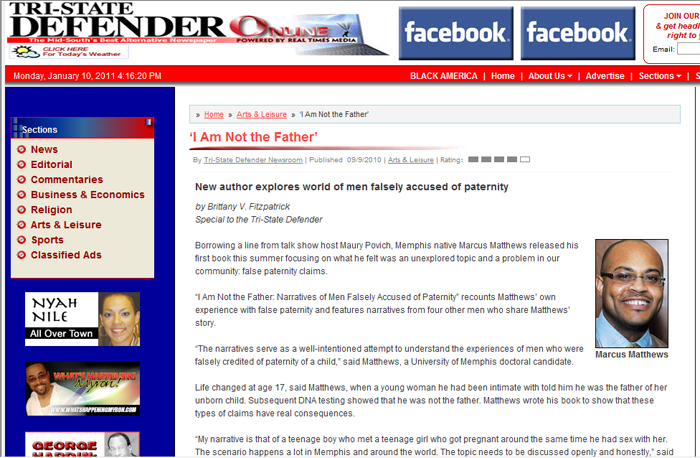 A native Memphian, Matthews will be featured in a segment during the show where he discusses his book, upcoming documentary, and his personal story about being erroneously accused of fathering a child when he was a 17-year-old senior in high school. 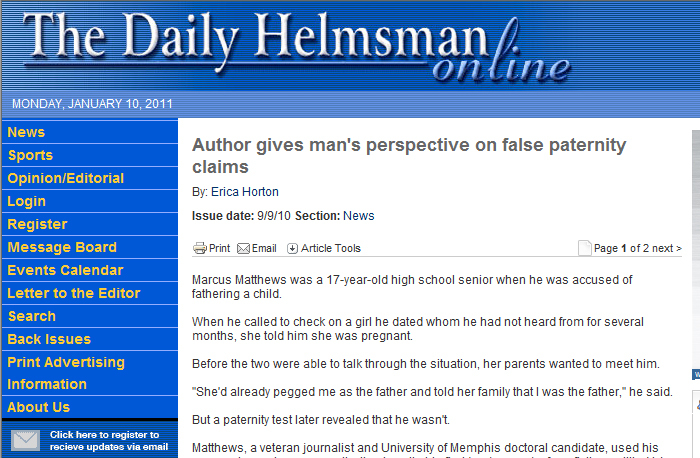 Matthews self-published “I Am Not the Father” in August 2010 and said he was flattered when he received the invitation to appear on the Maury Show, which boasts more than 3 million viewers daily. 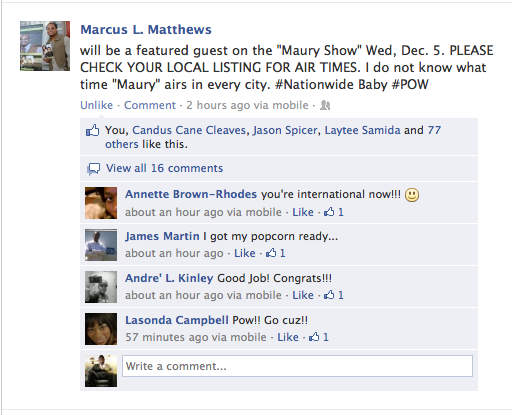 “It’s not every day that a Memphian gets to tell his story to more than 3 million people on national TV,” Matthews said. 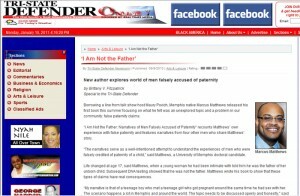 Since its publication, Matthews has used his book as a platform to address the issue of paternity fraud locally and now nationally. 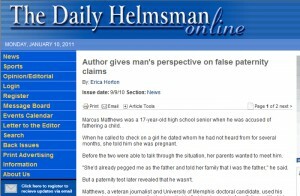 When he is not discussing paternity fraud or his book, Matthews teaches English at Hamilton High School and is currently a doctoral candidate for Higher and Adult Education at the University of Memphis. Matthews received his master’s degree in Instruction and Curriculum Leadership from The University of Memphis in 2008 and his bachelor’s in Journalism in 2003 from there as well. Matthews was recognized as The University of Memphis 2003 Newspaper/Magazine Student of the Year in 2003. He was recognized during The University of Memphis’ 2012 Centennial Commencement – one of only 101 graduates in the school’s history being honored. I will be speaking at the National Association of Black Journalists Authors Showcase in Philadelphia, PA. tomorrow. I will share the stage with big name authors like CNN anchors Soledad O’Brien and Don Lemon and former New Orleans mayor Ray Nagin. I am so humbled to have been invited to discuss my book amongst many of the nations’ top journalists. 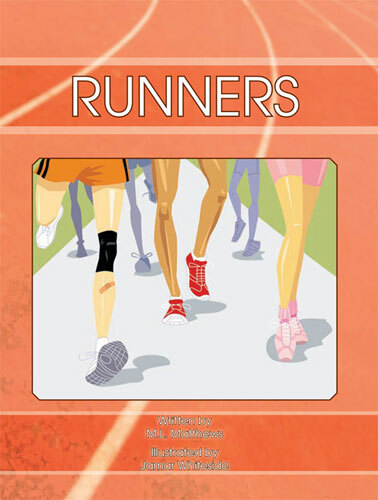 Please view the link in this email and forward it to your philanthropic friends and associates. I sincerely hope I’m able to secure enough funds to make this important project happen. 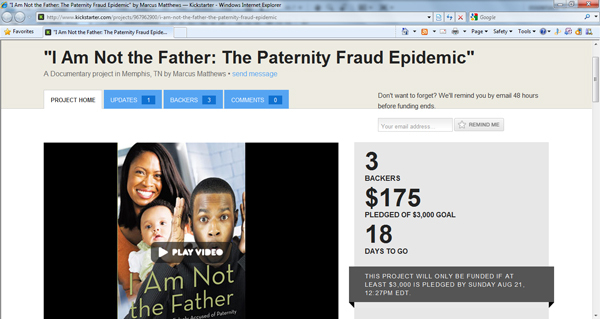 The invitation to NABJ validates the fact that my book is a shining example of cutting edge journalism and my documentary will change the way Americans view paternity fraud. I need donations to cover basic needs like production equipment and money to pay my production crew. Marcus L. Matthews talks with FOX13 about the teen pregnancy epidemic in Memphis and the lack of funding for student support services in Tennessee. Marcus Matthews was a 17-year-old high school senior when he was accused of fathering a child.